Hello all. 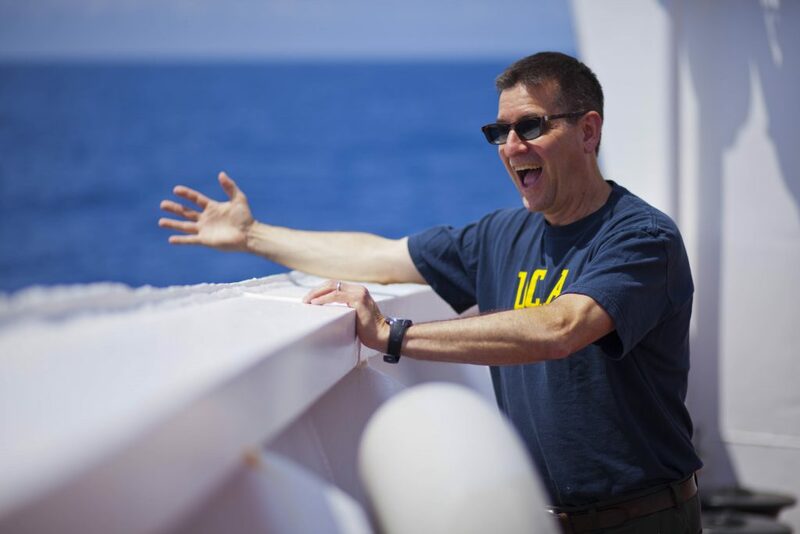 This Frank Tepley reporting from the JOIDES Resolution (JR) heading toward our drilling area in the southwest Pacific Ocean. We are about 120 miles SSW of Japan. Today, the ocean today is a beautiful grayish blue, and this color extends off into the distance on fairly flat seas. Yesterday, the ocean gods were roiling about making travel on the surface slow and pretty uncomfortable. Between swells, the ship would heave up (now I know the seafaring origin of that name!) and slap down onto the water with a loud metallic THRONG. The science teams are busy preparing for the upcoming coring marathon. All of the teams are thinking of procedures, work flow and description methodologies. We all have to be ready for action when the first ocean floor cores start arriving on the ship deck and in the science laboratories. Anticipation is building for this very exciting time. In the coming days, I’ll try to explain more about our mission, how things happen, and life aboard the JR. In the mean time, I’d like to extend a Happy Birthday to my oldest daughter, Sana, who turned 15 yesterday (I see a driver’s permit on the horizon. Yikes! ), and Congratulations to my youngest daughter, Brisen, upon her matriculation from 5th grade (Middle School, here we come!). Question of the day: What does JOIDES Resolution mean? JOIDES Resolution is the ship name, and JOIDES is an acronym for Joint Oceanographic Institutions for Deep Earth Sampling.